Beretta APX 9mm Pistol Full FDE 4.25" 17rd MAKE AN OFFER FOR SALE PRICE! 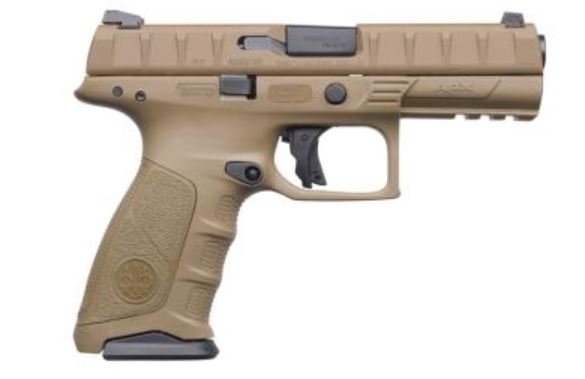 The addition of the new APX semiautomatic pistol completes the full size pistol portfolio and makes Beretta one of the few manufacturers to offer full size polymer and metallic framed handguns in both hammer and striker fired operating systems. Designed specifically for military and law enforcement operators the APX has been put through extensive testing and evaluation at the professional end user level. The result is a pistol that delivers superior performance in durability and reliability ergonomics trigger and modularity. Utilizing a removable serialized chassis frame the APX can be easily modified with replaceable grip frame housings and is simple to disassemble and maintain. Each APX comes with 3 interchangeable back straps so users can best fit their hands and preferences. The APX's aggressive full length slide serrations make slide manipulations easy under any conditions . To accommodate right or left-handed use the APX's magazine release button can be easily reversed and the slide stop is ambidextrous. The APX's trigger breaks at 6lbs and has a clear tactile and audible very short reset. The APX truly is the ultimate striker fired pistol from Beretta.